I live in Seattle, the self proclaimed "coffee capitol" of the USA. We have a Starbucks on every corner downtown, independent cafes all over, and even some Starbucks incognito as indie coffee stores. It's a wonderfully caffeinated culture we're brewing out here. A long standing joke among my friends at the University of Washington (UW): we drink so much coffee that we put a cafe in nearly every building on campus. This isn't quite true, of course, but we do have many! While driving home from school today it occurred to me to consider the joke in a different direction: how far on UW's campus can you get from a cafe? Are you ever more than 2 minutes away from a coffee stand? So I set about finding the answer! I grabbed the PDF of the campus map here, and a map of the food locations here. I converted the nice campus map to black/white, and then manually digitized the locations from the food map using Plot Digitizer (such a handy tool!!!) Lastly, the typical walking speed for humans is ~5km/hr, according to an expert source, which matched the number I had in my mind pretty well. Proximity to coffee map of the UW Campus. Green dots mark the cafes. purple = 1 minute walking distance, orange = 2 minutes. I realize I missed a few coffee spots on campus (e.g. north campus dorms), but I've got most of 'em. 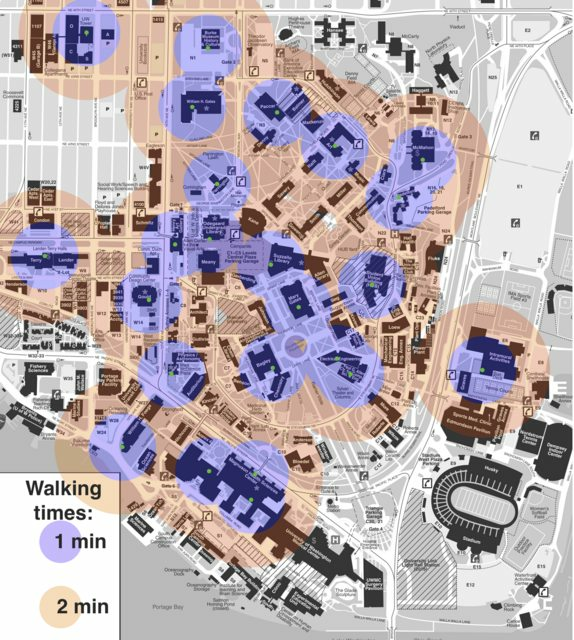 The main conclusion here: for nearly all of campus you are never more than a brisk 2 minute walk from your coffee! Of course I'm counting the HUB being open (under construction at time of writing), which solely fills a big region of the map and is high capacity. The only real notable gap is in the "Quad". West campus definitely has higher numbers of cafes, and if you consider the Ave it becomes entirely one-sided. What is so impressive is the nearly continuous coverage achieved using only my simple assumptions. Further, when you look at the map in detail there really aren't any major buildings left that could host a coffee shop. The new molecular engineering building (almost finished w/ construction) will get a cafe. A cafe should be built in the Quad, probably in Savery or maybe Smith. Great map! I like the idea. 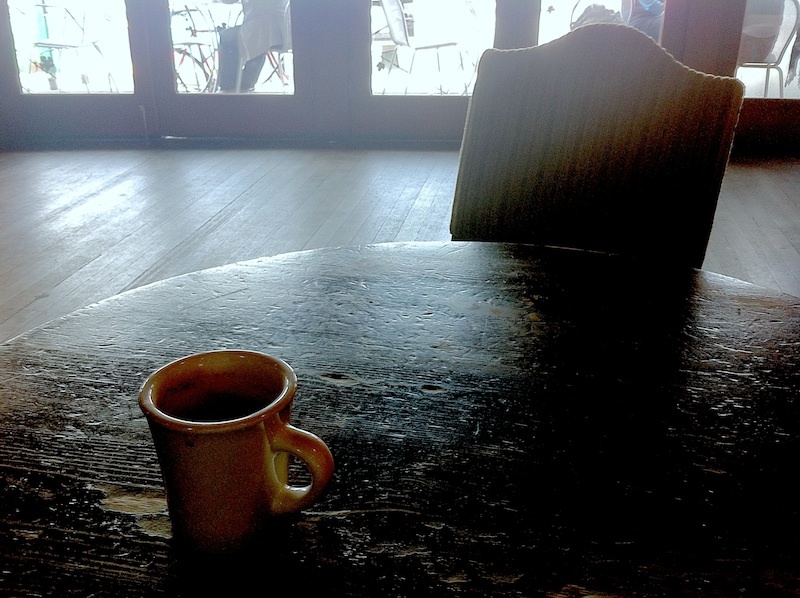 -The architecture building has a small, independent-from-HFS, coffee shop on the second floor. -The UW Medical Center has a coffee shop. This one is independent of HFS as well and is run by the hospital. -There is a restaurant in Conibear Shellhouse. It is frequented by athletes. I have never been there but I can only assume that there is coffee there. -The UW Club has a restaurant. They serve drip coffee. -As you mentioned in your article, Ian's Domain in McCarty Hall has a full coffee shop. I am not being critical of your article. I think these additional shops further prove your point. UW is swimming with coffee. Thanks for mentioning all those, I didn't know about the Shelhouse or Architecture shops! Thanks for reading and commenting!!! !